Offline Explorer for Windows 10 - offline browser to work with sites without an internet connection. It works on the simple principle: first, the user needs to load any number of services into the program by visiting them. Selected sites are added to offline mode and are available for viewing and editing. To quickly find interesting data in the browser built-in search sections of sites with the ability to customize keywords (matches or exceptions). In non-networked mode, proxies, scripts, CSS, Flash, Java, PDF, and other elements designed to display web pages correctly are saved. 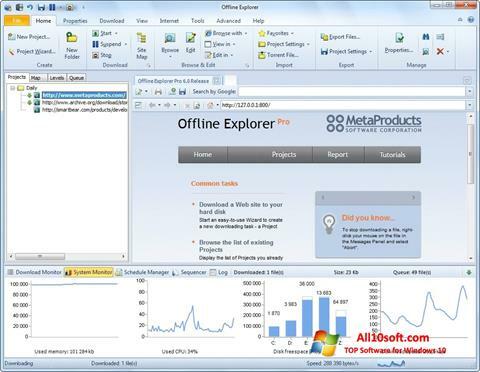 You can free download Offline Explorer official latest version for Windows 10 in English.